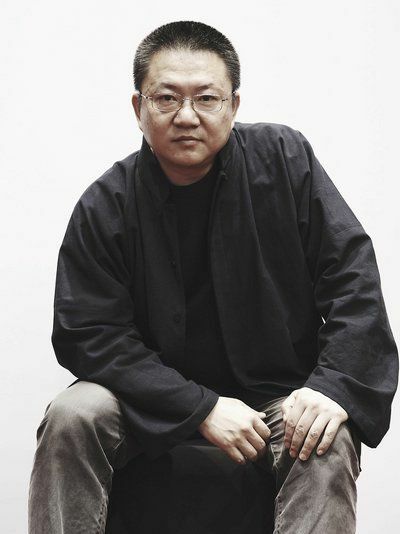 Wang Shu, the chinese national architect of the Hangzhou-based practice ” Amateur Architecture Studio ” has been announced as the 2012 laureate of the Pritzker Architecture Prize, receiving the most prestigious award to be given in the field of architecture. 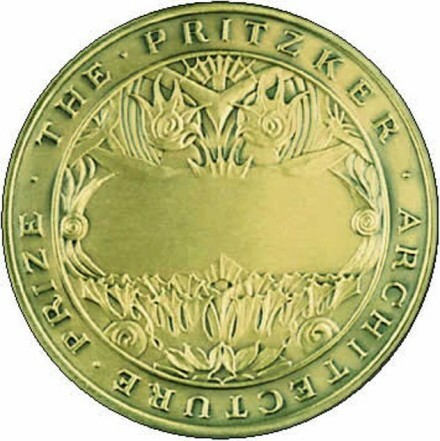 The Pritzker Architecture Prize, ( founded in Chicago in 1979 by the late Jay A. Pritzker and his wife, Cindy ) honors annually a living architect whose built work demonstrates a combination of those qualities of talent, vision and commitment, which has produced consistent and significant contributions to humanity and the built environment through the art of architecture. The laureates receive a $100,000 grant and a bronze medallion. 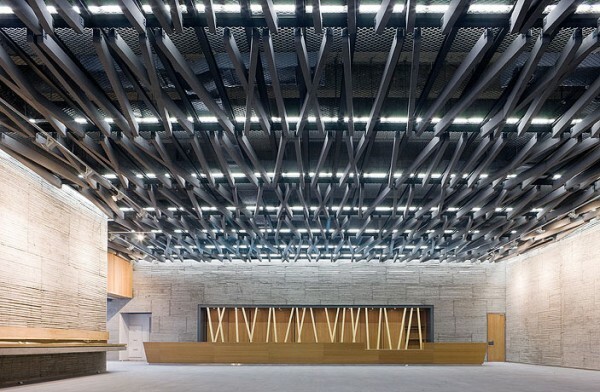 China has no shortage of modern architectural icons, from the Guangzhou Opera House to Beijing’s National Stadium. 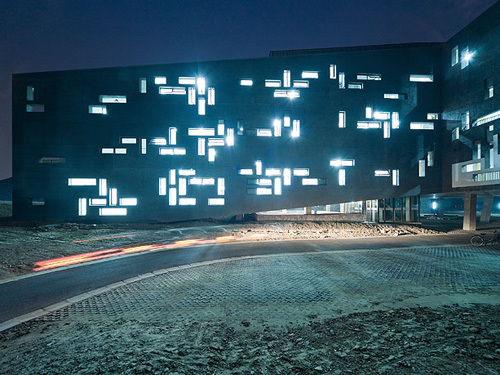 But most of them have been spearheaded by foreign “starchitects” enabled by government funding—take Iraq’s Zaha Hadid, Switzerland’s Herzog & De Meuron and the Netherlands’ Rem Koolhaas, to name a few. 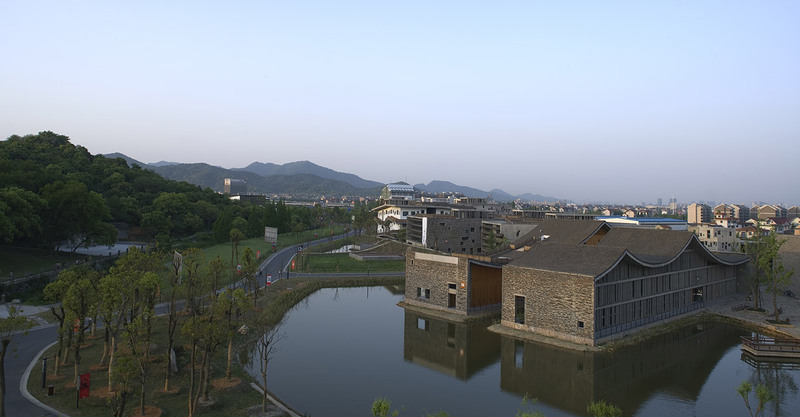 Wang Shu will be the first recipient to originate from China and will have the honour of accepting the bronze medallion in Beijing on the 25th of May, 2012 in the city which had previously been unveiled as the host of this year’s award ceremony. China’s rapid urbanisation makes the issue of “the proper relation of present to past … particularly timely”, said jury chairman Lord Palumbo. 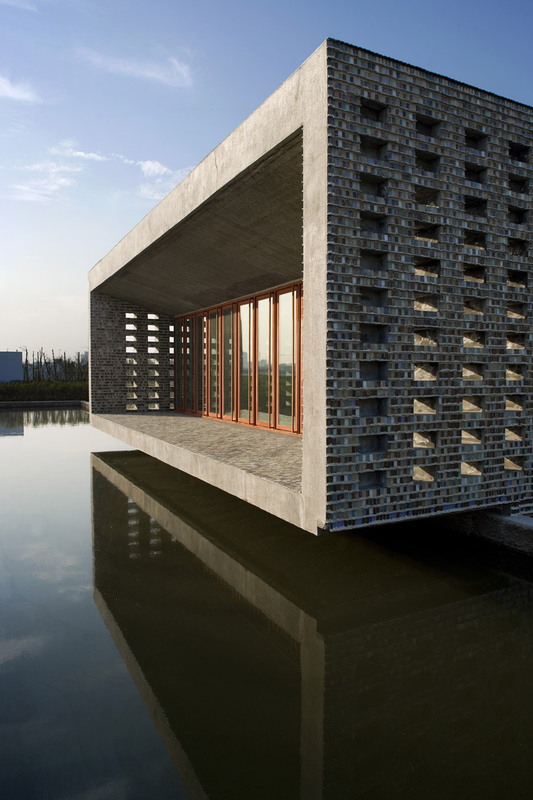 Wang is an architect deeply influenced by the essence of traditional Chinese buildings. 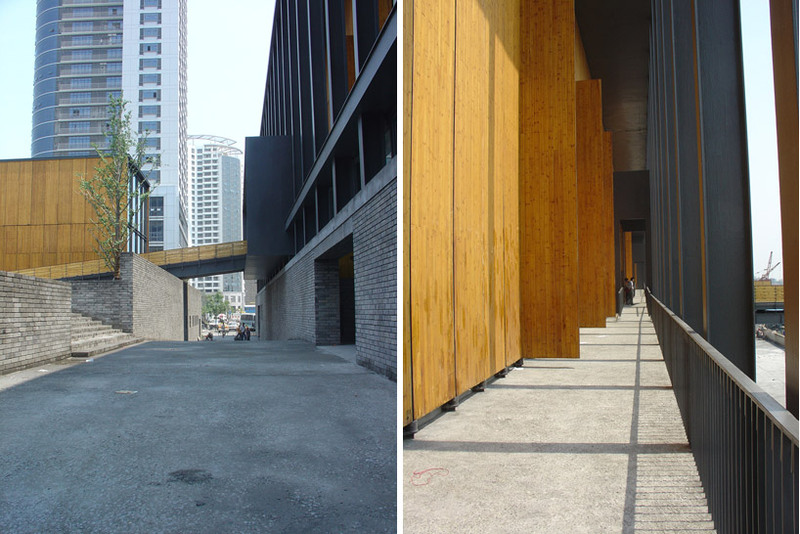 The elegant forms he designs pay respect to older structures seen throughout China. Graceful rooflines and humble materials define his aesthetic, a point of view that is both personal and informed by heritage. 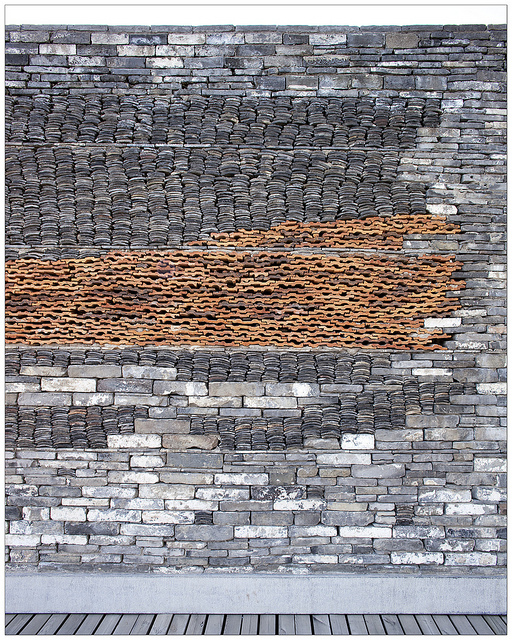 It is Wang’s fine tuned sensitivity to scale and materials that elevates his projects. He is a great refiner and his work is grounded by a humanistic orientation to design. 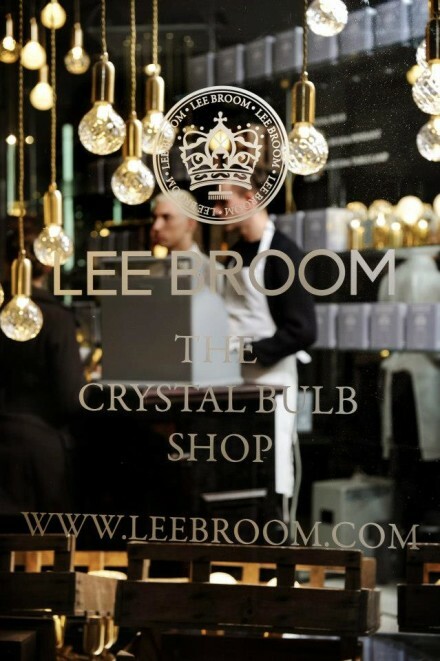 Each project acknowledges a respect for tradition, craft, and an appreciation for the hand of the artisan. 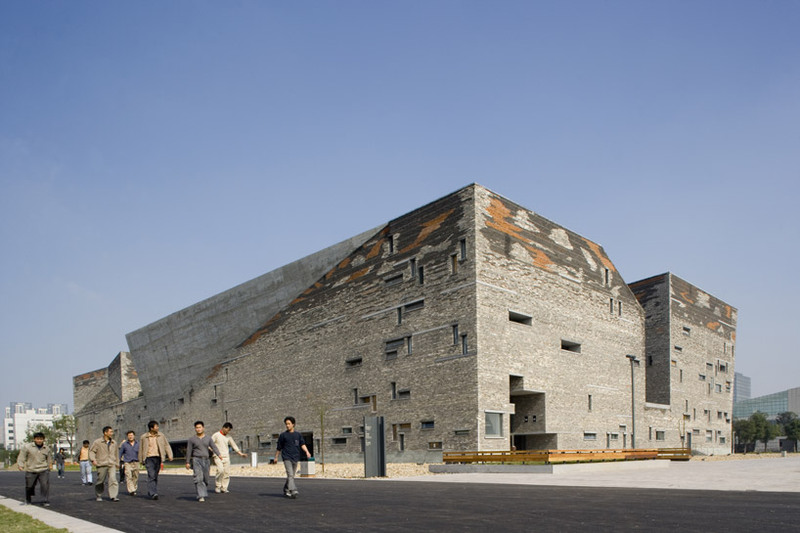 The jury praised Wang’s work as “exemplary in its strong sense of cultural continuity and reinvigorated tradition”. 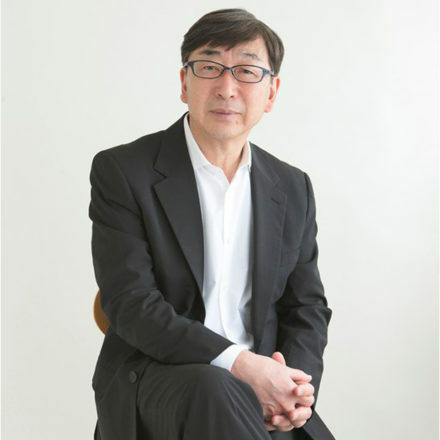 He hopes this prize influences younger Chinese architects to work within local contexts, slowly, on both large and small scales. 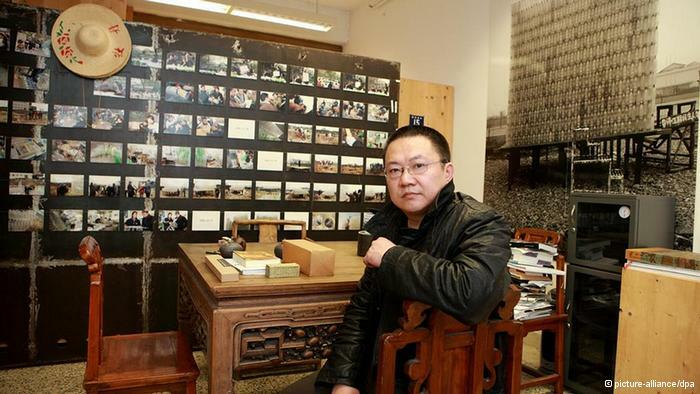 He also hopes he can influence this generation of Chinese architects to realize that China must not demolish history to develop. But change won’t come soon enough for his beloved childhood home in Beijing — the one with the drawings that the neighbors preserved while he was away. Karen Stein, writer, editor and architectural consultant in New York. Martha Thorne, associate dean for external relations, IE School of Architecture, Madrid, Spain, is the executive director of the prize. 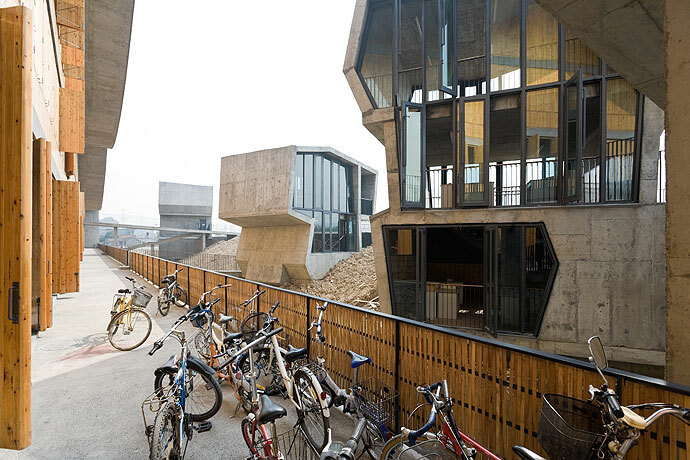 Wang says in the 1990s he had to get away from China’s architectural “system” of demolition, megastructures and get-rich-quick — so he spent the decade working with common craftspeople building simple constructions. 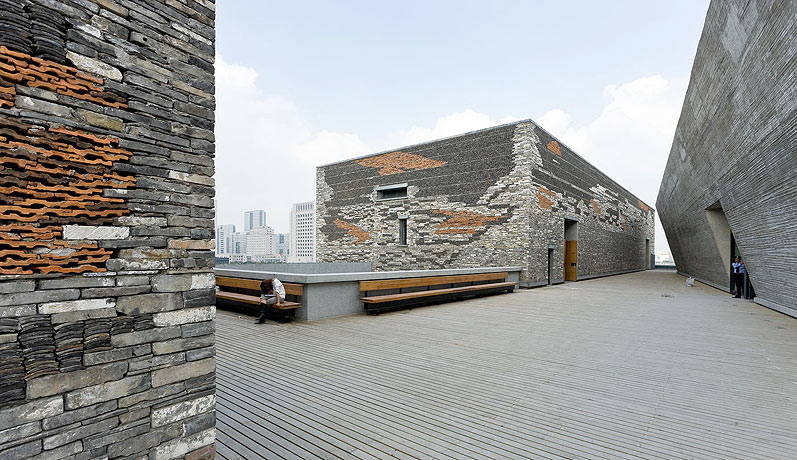 Since then, Wang has designed museums, housing and many academic buildings including an art academy campus using tiles salvaged from demolished houses. All of his work is in China, but he expects that to change. The Pritzker jury says they are signaling the increasingly important role China will play in the development of architectural ideals. Wang says that experience taught him to place a lot of faith in people. It made him want to learn more of their wisdom, and to give back to them. 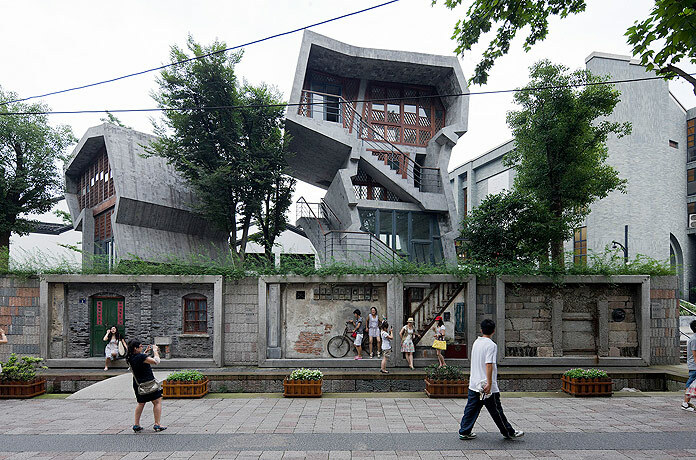 So he went to architecture school in Nanjing, but he says the way they taught the profession made it impossible to be a good architect. He worked to save and renovate old buildings; this was the time when China was booming — millions of people were moving to cities and the government built housing, schools, hospitals, subways and office towers on a scale and pace never before seen. But in the 1990s Wang was not a part of it. He dropped out of sight and “disappeared,” he says. For the next 10 years he found building projects being erected by more traditional craftsman, and from 8 a.m. until midnight he’d see how they worked, how they put materials together, where they put windows. If the project took three months, he was there nearly every day for three months. 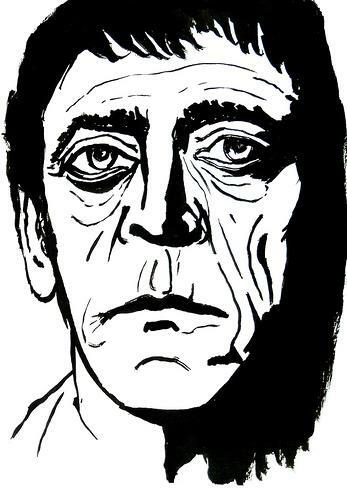 When he wasn’t there, he was studying anthropology, philosophy, movies and art history. 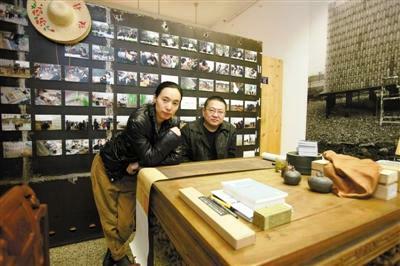 In 1997, he and his wife founded Amateur Architecture Studio. Handicraft is important, and Wang says he doesn’t like “professionalized soulless architecture as practiced today.” He says he works more like a traditional Chinese painter. When he accepts a commission, he studies the city, the valley and the mountains. Then he goes home and thinks about it for about a week, without drawing. 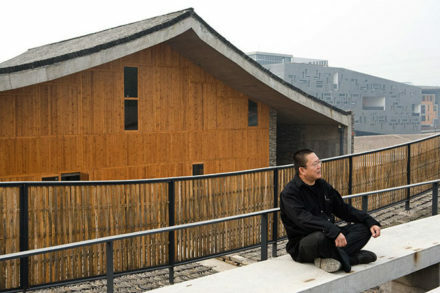 He says he drinks tea every day to stay calm, so his architecture doesn’t become too strong and overwhelm the landscape. Wang’s design for the Ningbo History Museum came to him at 3 in the morning. He realized his job was to show people what their city used to look like. He took a pencil and drew it from start to finish. 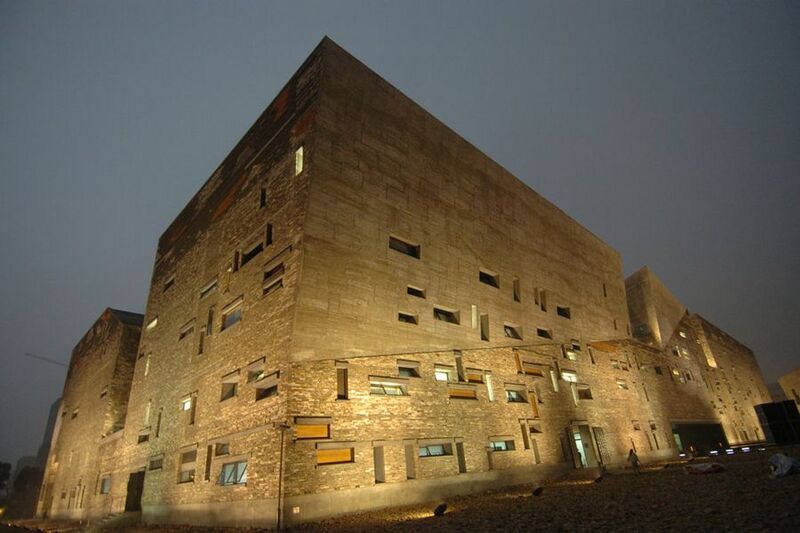 The modern design recalls an ancient Chinese fortress, layered with time’s passage. 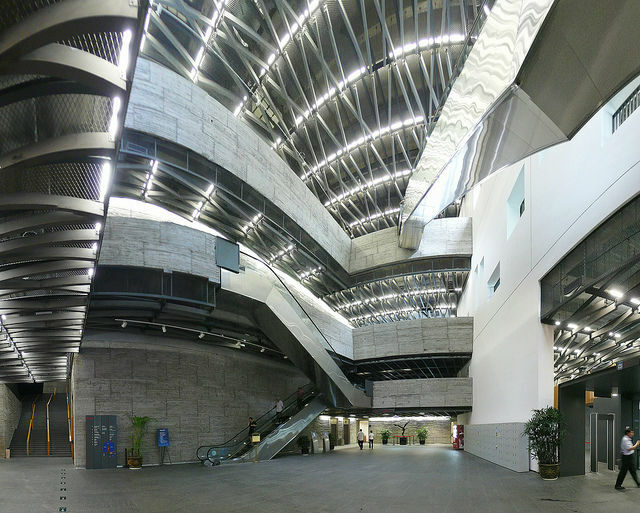 It is richly spatial on the inside. 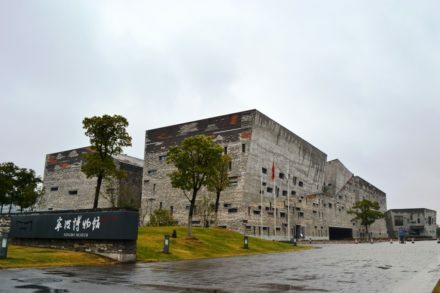 From 1990 to 1998, Wang Shu worked for craftsman to gain experience by learning everything involved in the construction of buildings through the renovations of old structures. 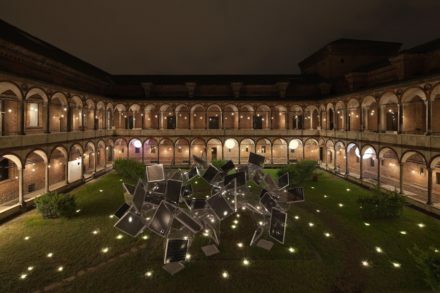 Mr. Wang heads the architecture department at the China Academy of Art in Hangzhou and has taught or lectured at Harvard, UCLA, the University of Pennsylvania and the University of Texas. He tries to recover what he has called the “handicraft aspect” of building design, in contrast to “professionalised, soulless architecture, as practised today”. 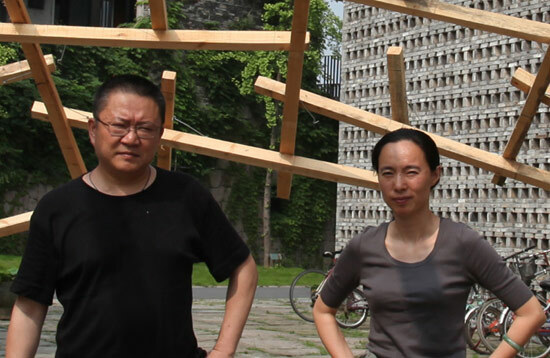 Wang Shu and his wife, Lu Wenyu, founded Amateur Architecture Studio in 1997 in Hangzhou, China. The office name references the approach an amateur builder takes—one based on spontaneity, craft skills and cultural traditions. 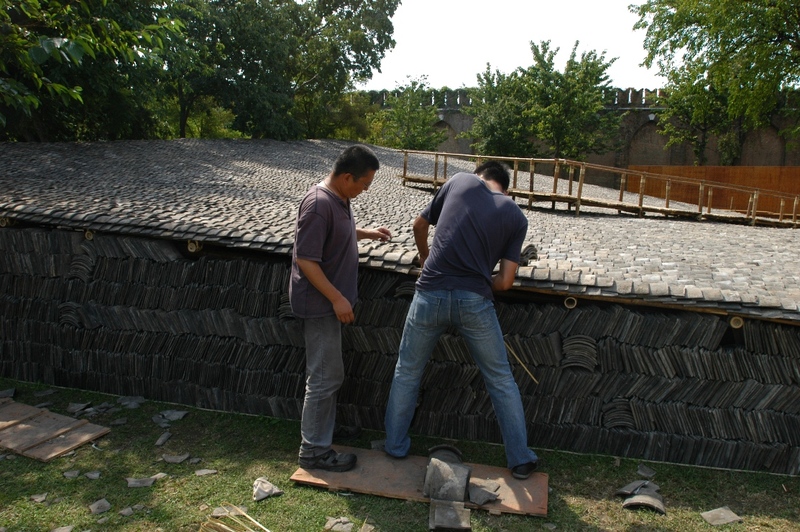 Wang Shu spent a number of years working on building sites to learn traditional skills. 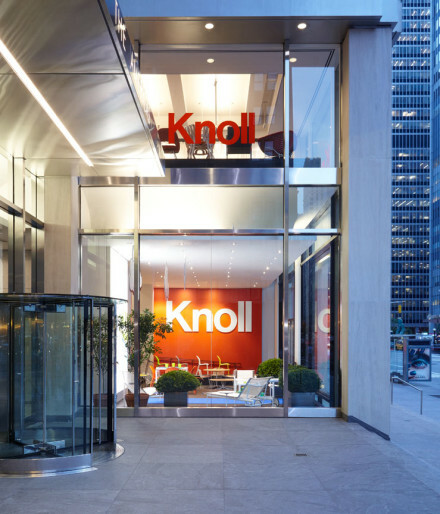 The firm utilizes his knowledge of everyday techniques to adapt and transform materials for contemporary projects. 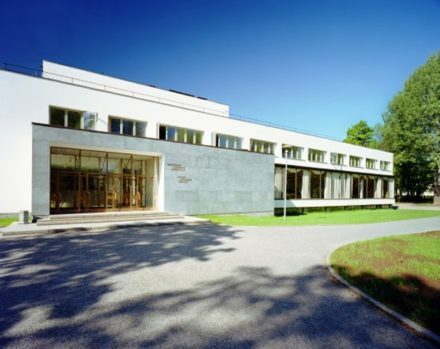 This unique combination of traditional understanding, experimental building tactics and intensive research defines the basis for the studio’s architectural projects. 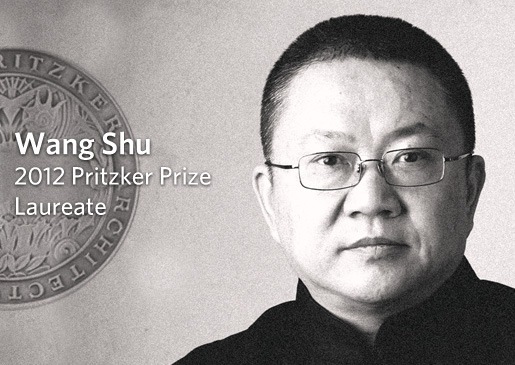 “All of a sudden Wang Shu is proving that we can produce quality work ourselves,” said Zhu Tao, a University of Hong Kong architecture critic and historian who was born in Shandong province and has practiced as an architect in cities across China. 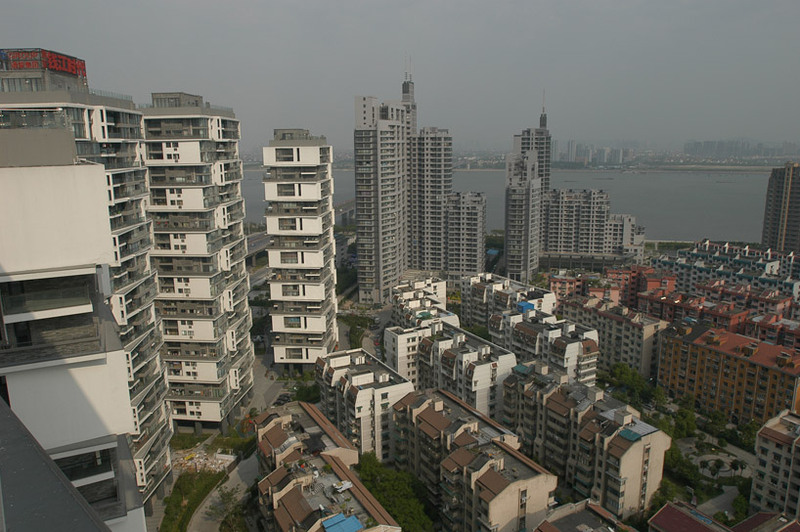 The remaking of China’s urban landscape by outsiders has led to hand-wringing in both the Western and Chinese press over Chinese architects’ lack of visibility. 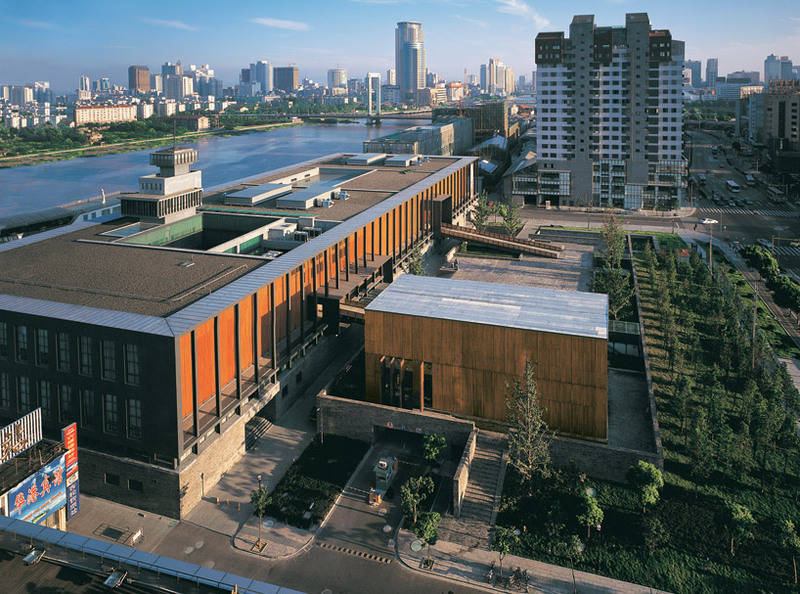 Against that background, Wang Wei (no relation to the architect), a professor of architecture at Southwest Jiaotong University, confessed she was surprised by Wang Shu’s Pritzker triumph. 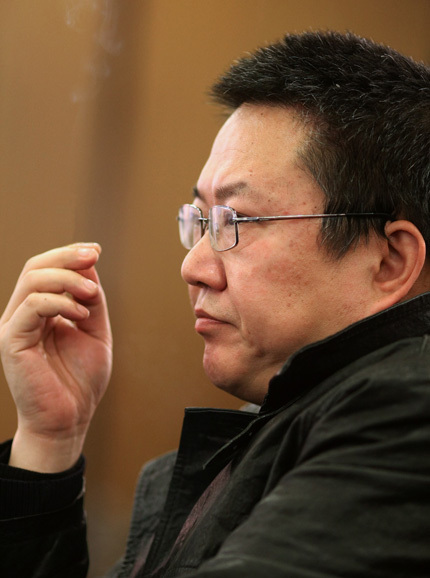 The 48-year-old Mr. Wang, who was born in Urumqi, in the western Chinese province Xinjiang, is a relatively youthful Pritzker laureate, Ms. Wang added. By contrast, I.M. Pei—who was born in Guangzhou in 1917, before the People’s Republic of China was established, and who was naturalized as a U.S. citizen in the mid-1950s and spent most of his career there—won the award in his 60s. 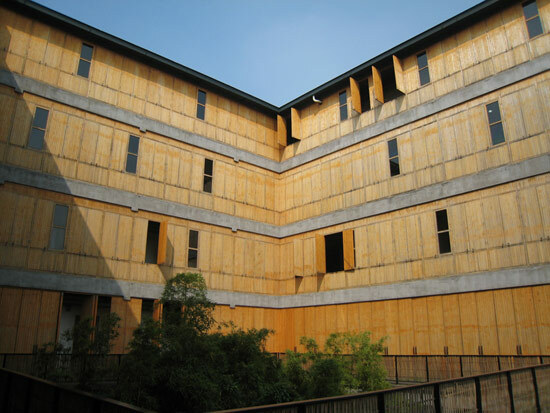 At his Hangzhou-based firm, Amateur Architecture Studio, established in 1997 with his wife, Lu Wenyu, Mr. Wang strives to develop a new language for Chinese architecture, fusing modernist forms with salvaged materials that draw from China’s culture and history. 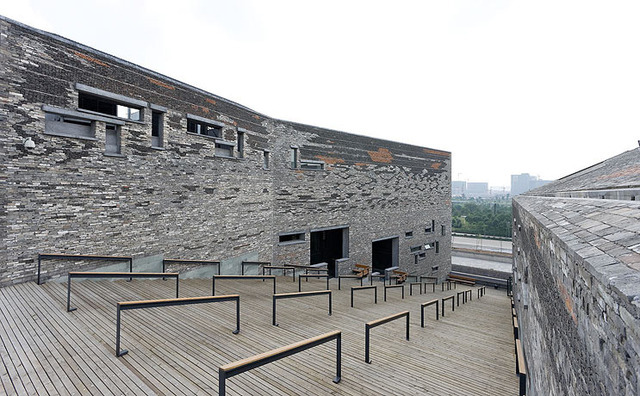 His Ningbo Contemporary Art Museum, for instance, reconstructs a former port building, while his Xingshan Campus for Hangzhou’s China Academy of Art is roofed with two million tiles collected from traditional houses. 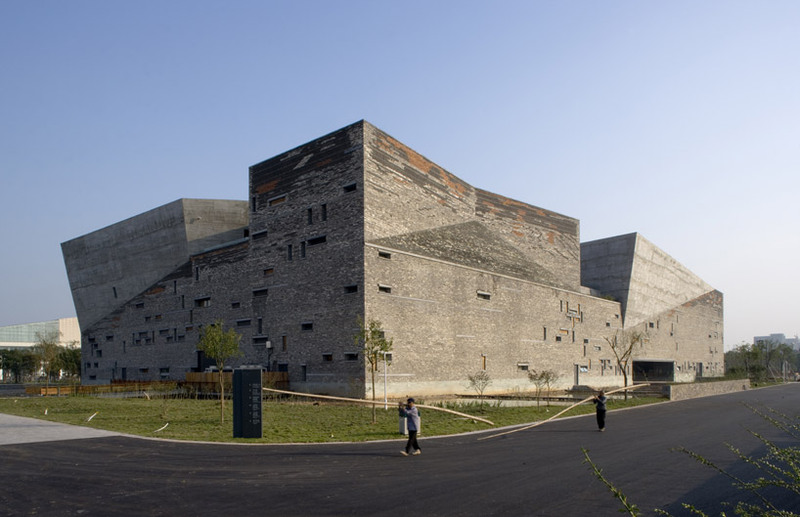 Foreign architectural firms, meanwhile, tend to approach China as a tabula rasa—or, in the words of Ms. Hadid, a Pritzker laureate and one of the nine jurors for the 2012 prize, a “perfect blank canvas” for architects. The award may also help China dispel widely repeated criticism, including from within the country itself, that it can’t compete with other countries in creative disciplines. People born in mainland China have won six Nobel Prizes, all but two of which were for physics. (The other two were the 2010 Peace Prize, awarded to dissident Liu Xiaobo, and the 2000 Nobel Prize for Literature, awarded to Gao Xingjiang largely on the strength of “Soul Mountain,” a novel published in Taiwan in 1989 after Mr. Gao had already emigrated to France.) 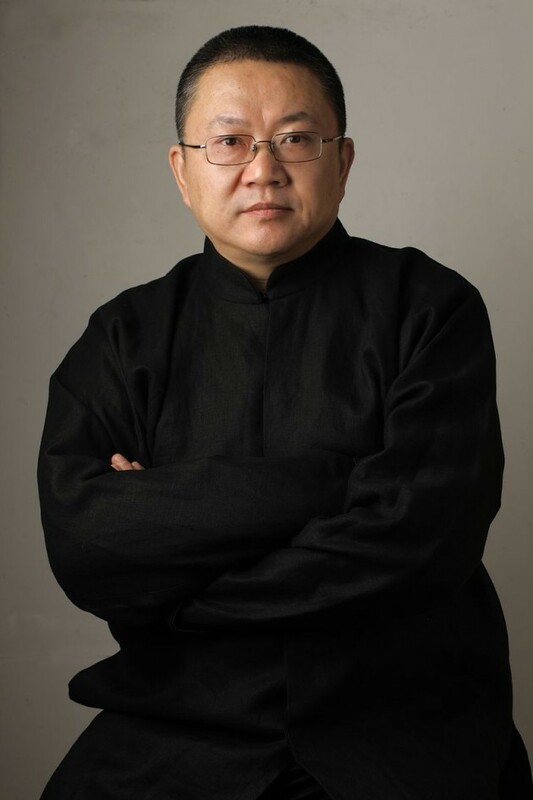 China-born composer Zhou Long won the Pulitzer Prize for Music for his opera “Madame White Snake” last year, but has spent most of his career in the U.S., having become a U.S. citizen in 1999.
International awards are often as much about politics as they are about rewarding accomplishment and innovation in the field, but the Pritzker Prize has been relatively apolitical exception in recent years. Architecture has at times been highly politicized – European modernism was for decades deeply intertwined with socialist politics – but lately, winners of architecture’s highest award, starchitects like Zaha Hadid and Richard Rogers, have been more known for their design and fame than politics. Then came Wang Shu. 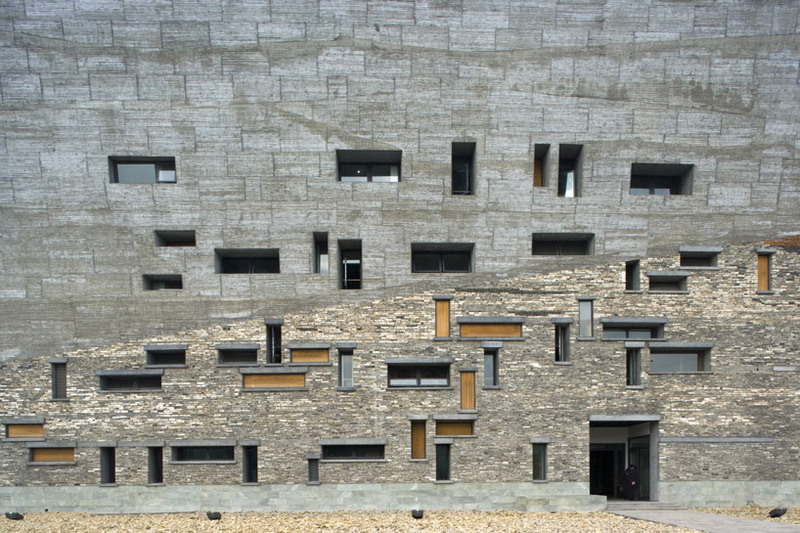 He may be the first China-based architect to win a Pritzker, but his prize is no great honor to the Chinese government or its architectural zeitgeist. 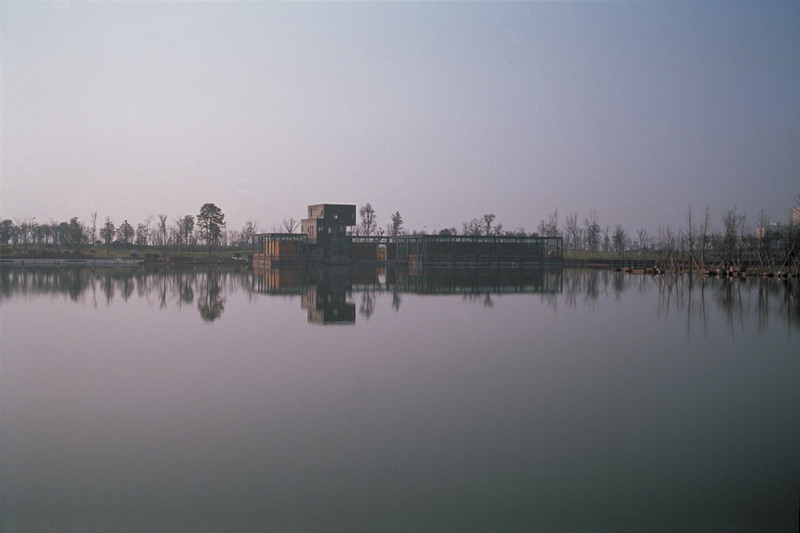 In the past Wang has built some more mainstream commercial and residential projects, some downright normal looking, but his work nowadays is embeded with a deeply critical message on the nature and pace of Chinese urbanization. 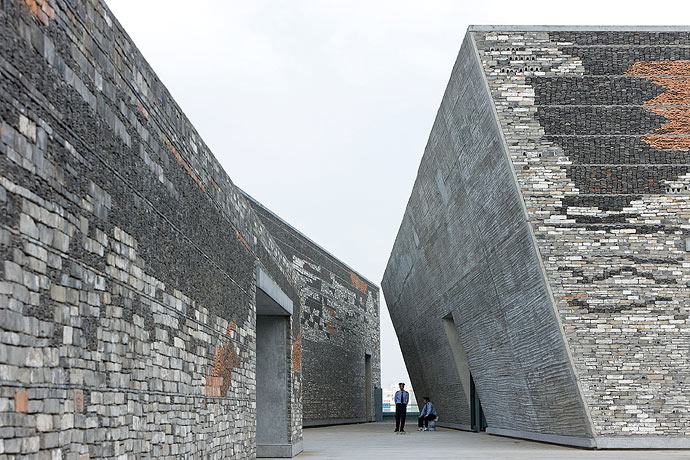 Wang’s most obvious theme is historic preservation. 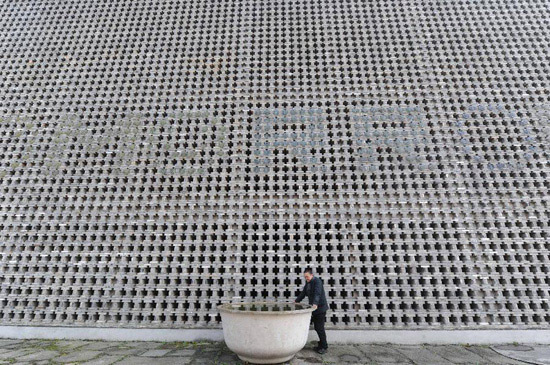 His most critically acclaimed building, the Ningbo History Museum, is a made out of recycled brick from the region, and his 2006 Venice Biennale piece, the Tiled Garden, was “planted” with tiles recovered from buildings that had been razed in China to make way for large-scale development. 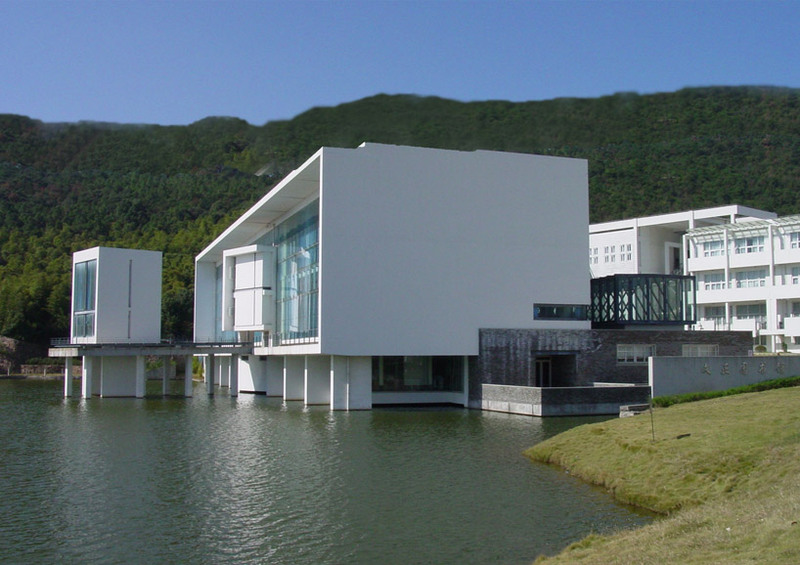 One obvious alternative to the hypertrophic Western model, which has been eagerly adopted throughout the Sinosphere and Southeast Asia, is the low-rise, tightly-packed Japanese urban model. With 35 million people, Tokyo may be far and away the world’s largest metropolis, but it’s relatively squat compared to towering cities Shanghai or Hong Kong – its tallest skyscraper doesn’t even break 250 meters, while Chicago has 12 taller than that. But for one thing, Japan is much more tightly packed than Wang’s spin on traditional Chinese urbanism. He says his ideal street is only twelve meters wide, but he seems to have no problem with the wide open empty spaces, recalling the “Western template” of modernist city planning. LA Times architecture critic Christopher Hawthorne quotes Wang as saying the traditional Chinese urban model was 50 percent built and 50 percent open space, which is quite sparse compared to other low-slung world cities with narrow streets. Charlie Gardner estimates that the cores of Paris, Vienna, and Barcelona (specifically, the Eixample neighborhood) are about three-quarters developed, with Tokyo rising to 80 percent building coverage, leaving only a fifth of the land for streets and open spaces. 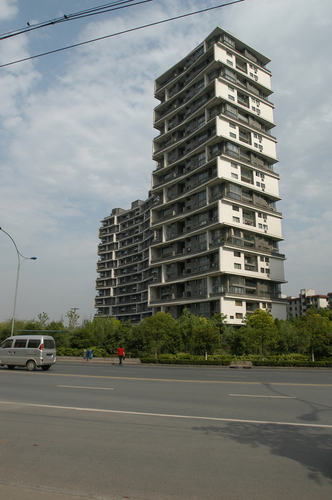 It’s not hard to see why Wang, and many in China, would adopt such an anti-urban stance. Modern Chinese urbanization is similar in pace to that of the United States around the turn of the last century, but it does not always share the same respect for property rights, which are especially poorly established in the Chinese countryside and on the ever-moving urban frontier. Wang alludes to China’s heavy-handed use of what we in the U.S. would call eminent domain, pointing out that his firm refuses to do projects where residents are moved “by force” – something that the Chinese authorities do with far less impunity than American developers one hundred years ago. And while political pressures and Wang Shu’s continued residence in China surely keep him from speaking directly about it, it’s not hard to see the politics of his birthplace, Ürümqi, coloring his perspective of urbanization. The city, and ones like it across China’s peripheral provinces, are on the front lines of the central government’s efforts to weaken the demographic strength of minorities like the Uighurs and Tibetans in their homelands. It does this by diluting the regions with Han (China’s dominant ethnicity) newcomers like Wang Shu’s parents, who end up clustering in large cities – Xinjiang Province is 45 percent Uighur, while its capital, Ürümqi, is 75 percent Han. The city errupted in deadly ethnic riots in 2009, and tensions continue to this day, with twelve killed in riots in the predominantly Uighur city of Kashgar this morning. Another ugly side side of Chinese urbanization that Wang has seen first hand is the massive destruction involved in China’s catch-up growth. Before the liberalization of the Deng Xiaoping era, Chinese cities hewed to the “socialist city” model, as described by Alain Bertraud and Bertrand Renaud. Administrative planning chose to pile new housing on the urban fringe rather than gradually redevelop the city center, resulting in an awkward “circus tent” shape and an underdeveloped core. Deprived of the opportunity for organic redevelopment during much of the twentieth century, Chinese cities must negotiate between two unappealing extremes: freezing cities as they are, risking Indian-style urban stagnation; and allowing unchecked redevelopment in the core, risking much of China’s architectural heritage. But despite China’s problems with urbanization, the movement to cities remains an enduring trend throughout civlization, and not one that Wang Shu, or anything short of catostrophic economic collapse, is going to be able to stop. A retreat from the world of modern city building like the one Wang has embarked on for the last two decades is simply unrealistic for China. Would-be urban migrants are already chafing under the restrictions of the hukou system, which keeps citizens registered in rural areas out of cities (at least legally). Even Indian-style restrictions on vertical urban growth seem unthinkable, and given India’s stubborn poverty, it’s probably not even desirable. A halt to the demolition of old neighborhoods is a worthy and realistic goal. 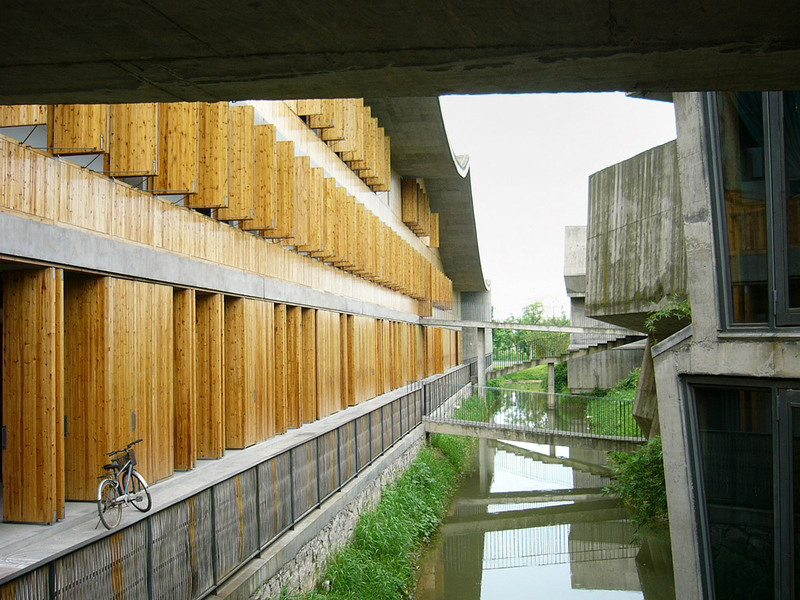 But without a willingness to make up for the missed density elsewhere, Wang Shu’s brand of anti-urbanization risks irrelevance in the face of hundreds of millions of rural Chinese banging on the city gates. 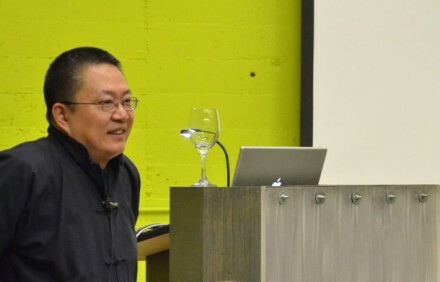 In an amazingly prescient coup, UCLA’s School of Architecture hosted a lecture by Chinese architect Wang Shu, the very week it was announced that he had been awarded the 2012 Pritzker Prize. To Build a Diverse World Following the Natural Way. 18:36 Clapping and the dimming of lights. Introductions by Neil Denari, Vice Chair. He got a call this morning from Caroline Blackburn that Wang Shu won the Pritzker Prize – he was so happy he thought he had won. What a cool moment and honor for us to have him. Wang Shu is only 48 and still a very young architect. He heads the Amateur Architecture Studio… Lets just talk about the different between two french words: amateur (lover) and also auteur (author). The way architecture should be thought through and delivered to the world, if its not about love what is it about? Another definition of an amateur is someone who engages in activity for pleasure, rather than financial reasons. He keeps his office under 10 people, and chooses not to grow it in order to keep the tradition of amateur very strong. He is the lover of architecture, not the author, and if we could keep it this way..
Wang Shu: I wanted to take two years off my work, because my son is ten. 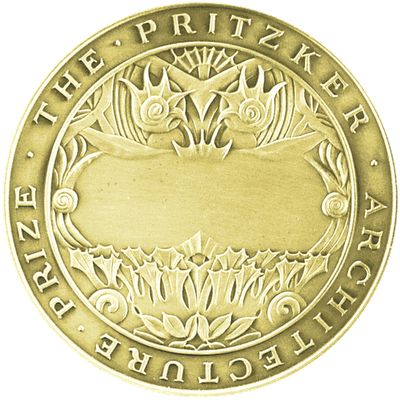 But then I won the Pritzker Prize. and now I dont think I can stop. But you know I do believe I should stop, and enjoy my life. Architecture is not more important to me than life. I dont believe you can be a good architect if you don’t have a good life. When you do the design, what do you want through your design process – what do you want to build? Is it just architecture? Everytime I dont just want to design architecture, I want to design a small world. Architecture is not just one space – it is more about time. I dont know if this is clear. But I’ll continue. The imagination and the real reality about China: I think many people are inetrested in China, but most of the talk about China is from their imagination. We are the architects, so of course we talk about the city as a stage. I live and work in a beautiful city: Hangzhou. Its near Shanghai, not very big. 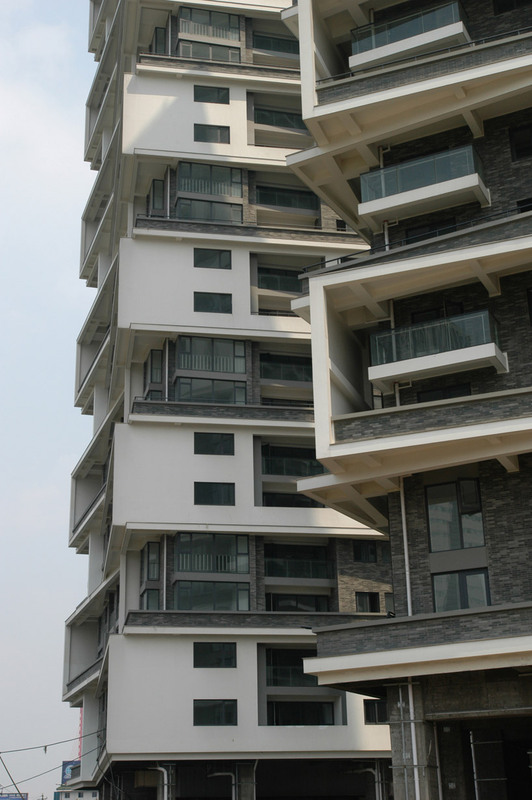 The city is more similar to landscape, the architecture is mixed in with the landscape. 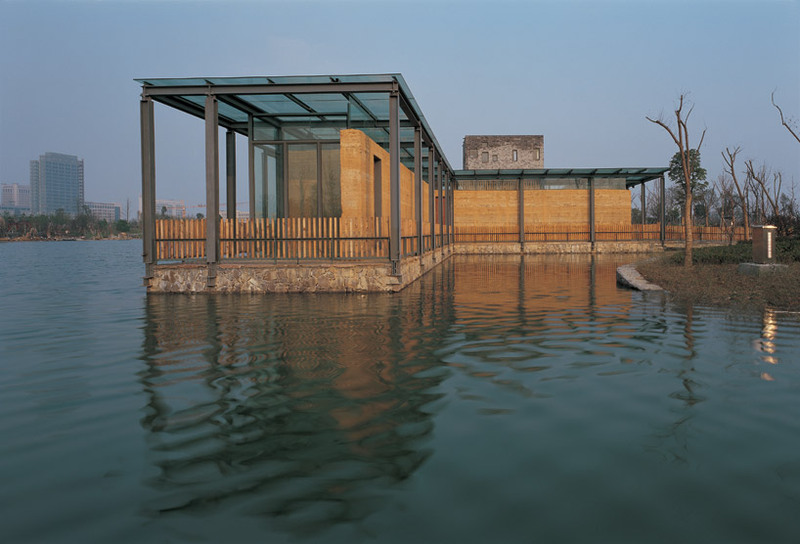 If you have a chance to visit Hangzhou, you can still find in the center of the city a lake. Its not in the suburb – but the center. A thousand years ago, Hangzhou was the capitol of China. 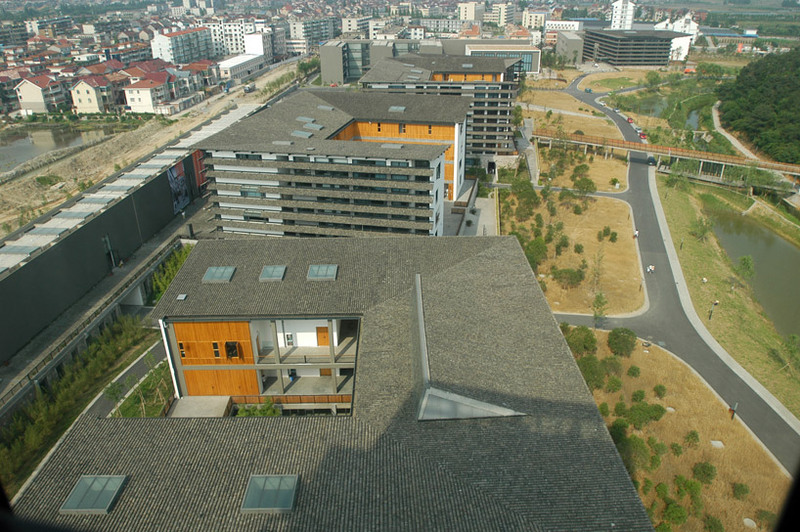 If we talk about city models, we talk about Hangzhou. Two years ago I finished a project along this street – years ago it was the main street only for the emperor. Just within twenty years, every city in China has lost its identity – they’ve all been changed, the roads, community, neighborhoods have disappeared. Originally Chinese did not like to move, they were rooted like plants. Then newspapers began to say, we should live like American people. And now Chinese move – they buy one house, they buy two houses, and they move. 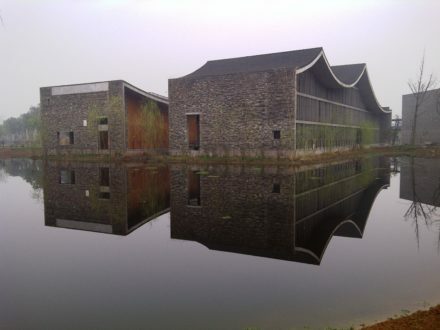 China is very special: the architect can’t work in the country side. The farmers build in teh country side. When people talk about the traditional city and village – they still have some power, but I dont think they’re revolution, but evolution. The neo Chinese farmers learn from Western history, from the city, they learn and adapt and build some strange new building. What about the future of the Chinese country side? China is a country where poetic atmosphere existed everywhere. In China we have many paintings – foreigners just see landscapes. But its not easy, to produce this painting. Every dynasty has just two or three who can produce this. Its not just drawing, but thinkig, philosopher and research into trees, mountainside. And finally you can compose a new nature painting. Sometimes I think it is very similar to design, this painting. But then I think how are they able to do that, they can control such a big landscape? How do you build this space, to control something so large. This painting is 1000 kilometers! The width of viewing and thinking (slide title): For Chinese, natural means, how can we do something that is true? This painting is actually very small but it has so many different details, and people understand the mountains, water, bridge, everything, the whole nature. Someone designed this. How did they do it? Just talk about horizontal. I’m visiting Los Angeles and I think – ou can see the horizon. You can still see the line of the land. The height of viewing and thinking: Now we talk about vertical. In China we have a tradition esp for scholars, we have many trip. If you want to become a scholar, you atleast have a trip – that means walkng. Then maybe you can become a real scholar. 10,000 km trip. The tradition is that the scholar leaves his family house, spends two years, three years, takes a giant trip, takes boat, takes horse. Because its a long time, they need an assistant to carry a book with him. what to view and think (slide title): what do scholars think about? (In landscape slide, draws horizontal line) – the scholar lives above the line, in the ideal, and below the line is reality and life. I like the French writer Proust’s writing on memory – how do we understand memory? Memory is not part of a master plan, memory is not precise. First you have a memory, in small pieces, they come in taste and smell, then they remind you of other things, associations until it builds. Memory can remind you but then become the real thing. We can design something that can become real things. Its the basic principle for Chinese garden. The traditional Chinese garden is not just a park, but a philosophy machine. it helps you understand what is the meaning of nature, what is the structure, how does artificial operate? What about time? I really like to talk about time. 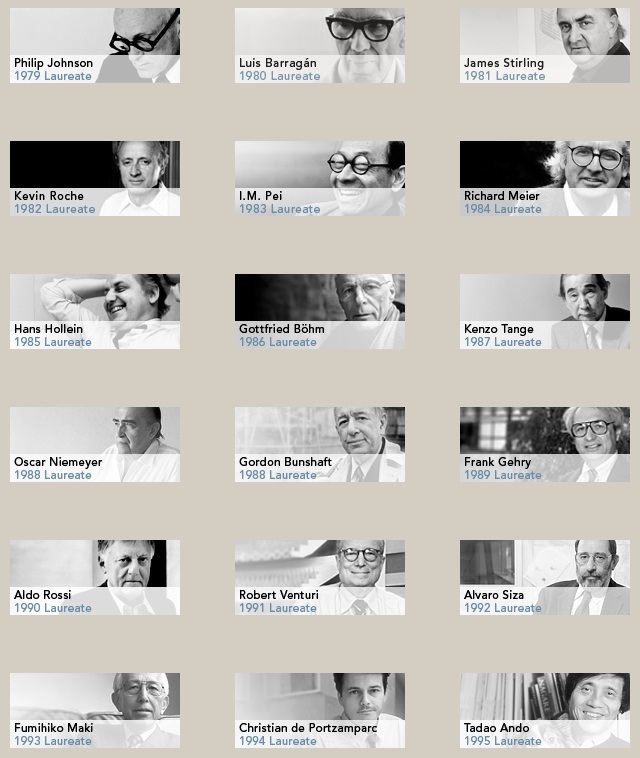 After 100 years of radical changes, does poetics still exist? I think not too much. Of course, for real work, for real practice, it begins from some common things, small things. Ruins, for me have a very special meaning. Everyday you see something like this (image of demolition site in China), its very good, its another side for architects and architectural students. Something like this, you can tell its a building of bricks, decayed, near to demolished, but also very poetic. Every year myself and my students wll take visits to the countryside, because the origin of culture is no long in the cities but the country. We photograph and document the trip. So many things still exist in the country side – its our hope, our future. We do this type of research and I finally made a project called 1000 Village project. We have over 10,000 rural villages and 90% are destroyed. In 1990, I didn’t do any architectural design. I stopped for many years. I went off the market, I went out of the system, I wanted to find my way of designing. In China, like America, they’re just talking and drawing on paper, but they don’t really know materials. In construction they change your design, there’s no responsibility. Maybe there’s a different answer – in 1990, I only did building renovation works. In China, this also means you switch social standings. Every morning from 8am to 12 at night, I was there and I wanted to know everything. Up to now I still do many research on this. The constuctors don’t have any drawings, any designs. They do it from memory. So how do they do it? They have over 200 rulers, and every ruler has a way to connect, tells you how to connect. 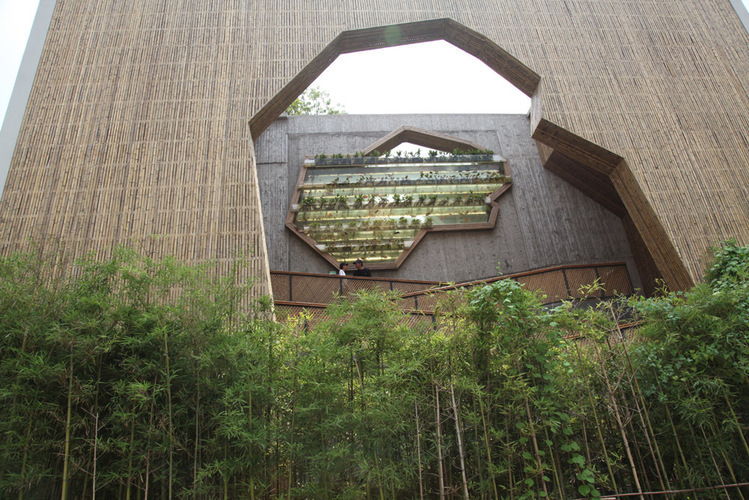 200 bamboo rulers become structures, become design. Its like the modern way, because they prepare all the elements before hand. They prepare it months in advance. They have clear principles, like mathematics. Its a very rational system – basic secret to Chinese culture! 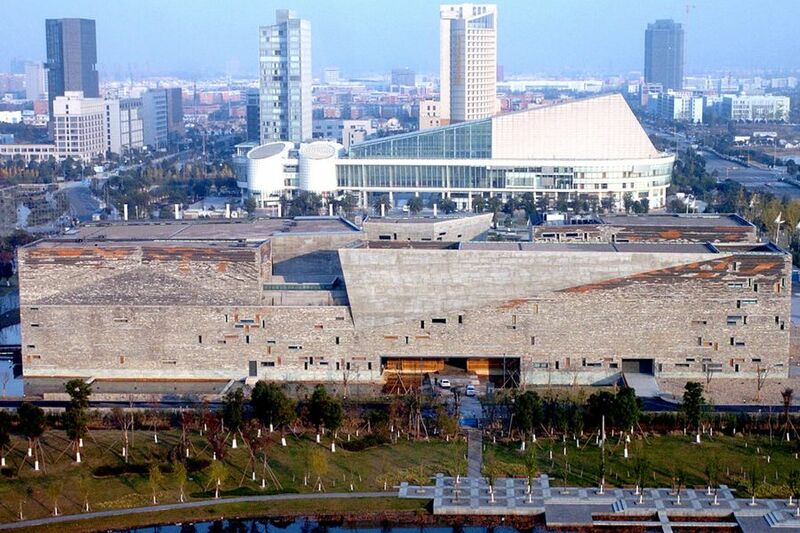 For 2006, it was the first time China wanted to build a national pavilion in Venice. 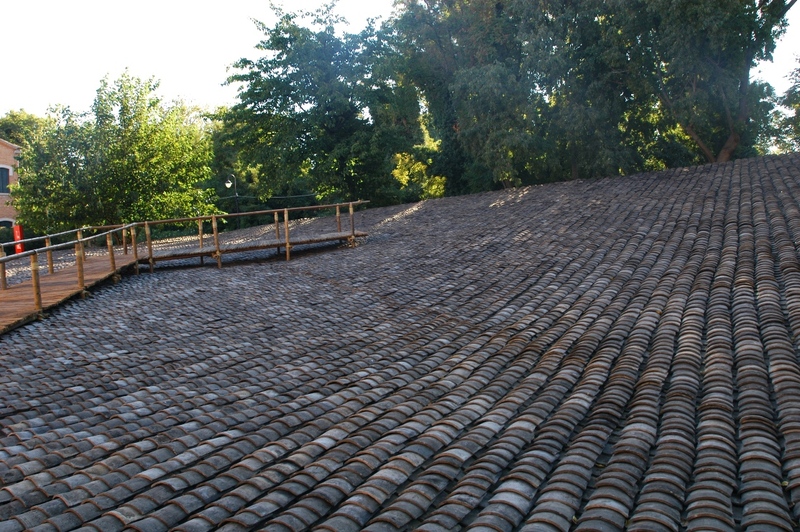 Just three craftsmen and six assistants, nine people – in 13 days we finished this – the 900m Chinese pavilion. I had a memory that the Italian people were very proud, they doubted we could finish. But one week later we finished. Some people ask, how do you do high quality experimental work at this scale? I think its easy, its parallel lines. Before we work, we research local architectural traditions. We did a four year research in Ningbo (spelling?) and then we do some small experimental 1:1 scale prototypes next to it. 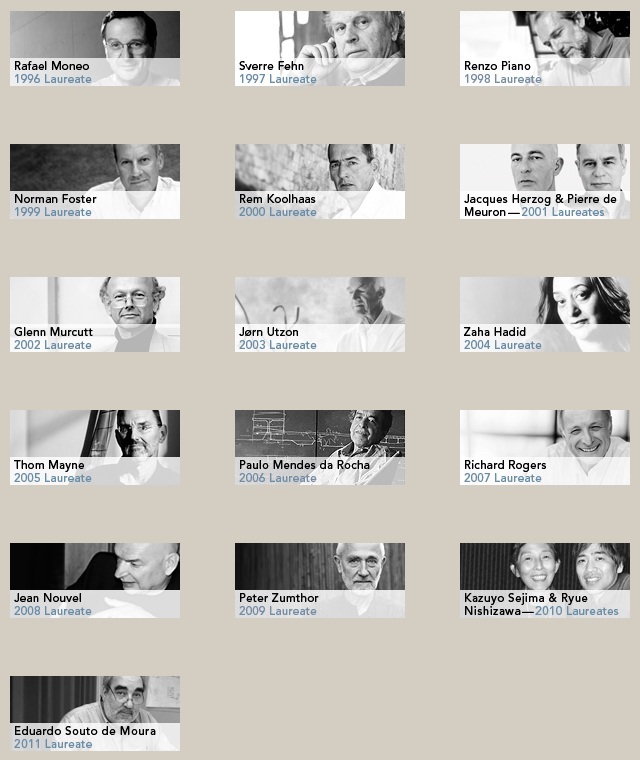 Is it possible for arch to be more flexible and participate in shaping new values? A differentiated utopia: China we have very powerful central system, but the other side, Chinese culture is so interesting because even until now, it can have such diversity, variety, in different areas and culture. If one day, China lost its diversity and variety like in this country, real difference, not just the surface, then we have totally lost our tradition. 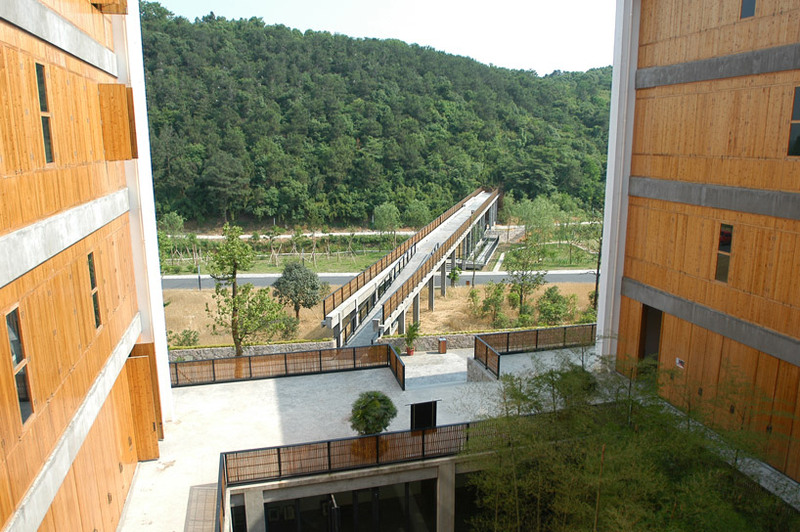 Xiangzhun Campus – More than 15,000 sq m design. It was very fast, 22 buildings. In my brain, its not just the master plan, many small things and pieces are in my mind, then they become clear, they become physical things. That’s the Chinese way, the details. The master plan is not the first state, but the end state. When everything is clear, then you have the master plan. 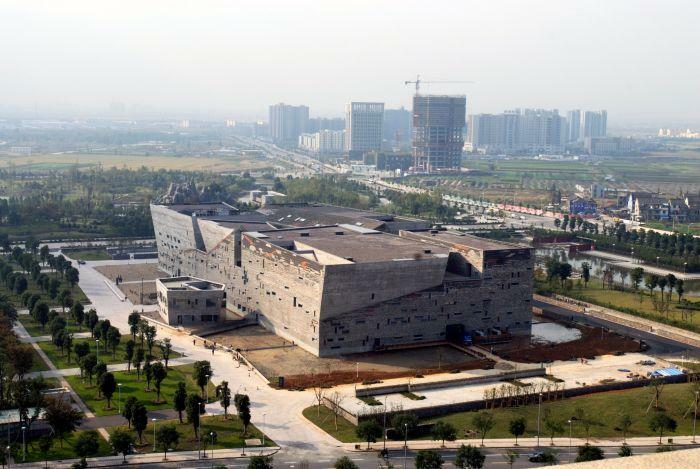 One deep impression I had was one young Chinese architect said, its so ugly, this master plan. But then they went to the site and saw it, and said, everything was right. You are right. Natural and artificial, I like something like this. 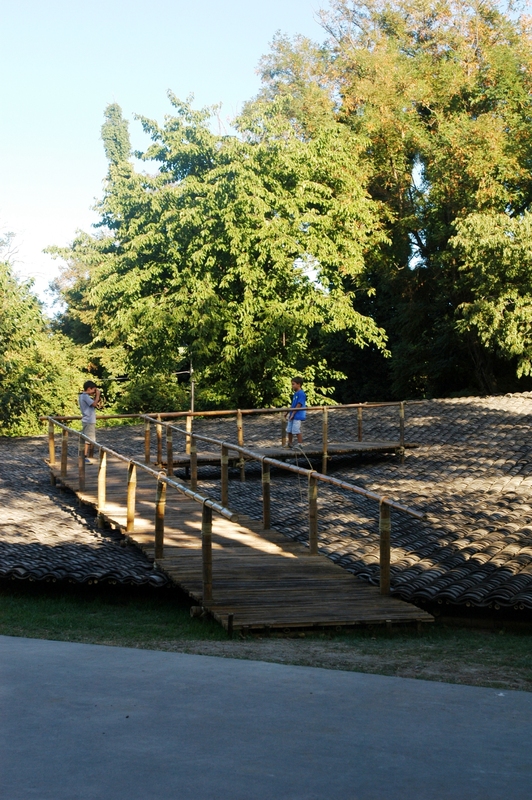 Stone steps worn by people walking and water. but also artificial, man made. 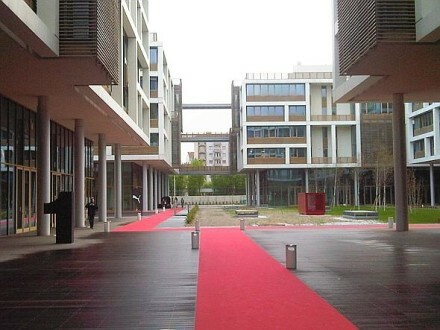 The campus, when we finished, two photographers came to take photos, they said, they don’t know how to take photos. Even one single facade. Why couldn’t they do it? Because here the architecture was not the most important. 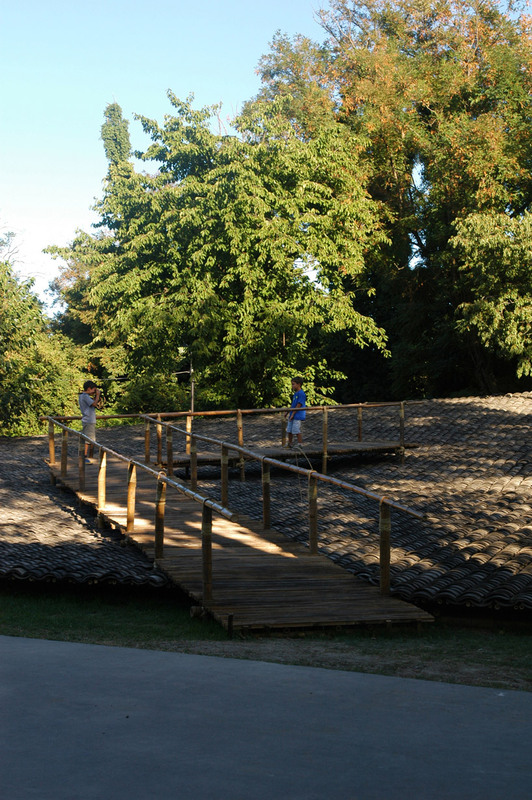 The different walkways, the different heights, are all different – its two things together. The inside and outside vision are different. So how do you experience my work? – Maybe as a scrolling landscape. How to find cheap but energy saving way of construction? Not just low budget, A new thick wall system engenders effective heating insulation. 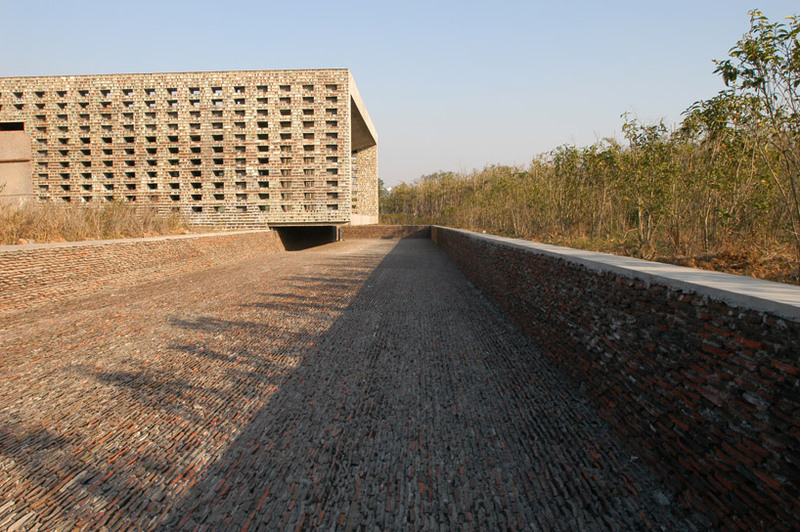 The whole project also uses 7million recycled bricks – thats a huge amount! But another interesting thing is that my building is touched by many hands, that predates this work. First year, 1 teacher, 20 students. In the first two years, craftsman skill training. 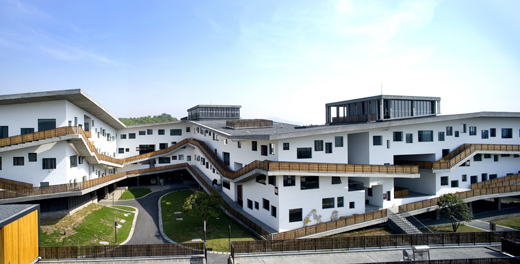 we have the best laboratory in china. I do many many studios. not many people know us, its my way, its my style, to keep it a secret. many friends know our school, but not many people. 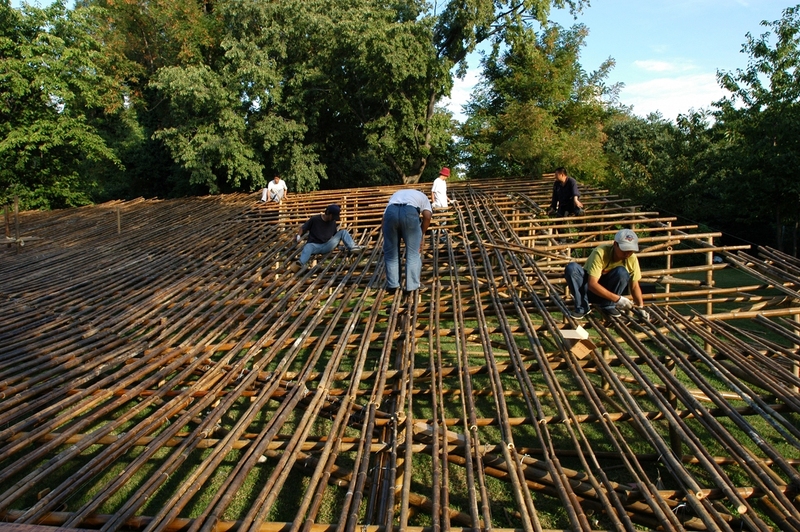 The best way to do research about bamboo, we do the construction. How big is this building? 30,000 squre meters for this one building. In fact, when you go to the site, its huge. But when you see in the photos, its not that big. Like Chinese paintings, when you see an image, you think its small, but when you see it, its large. What does that mean? What is small? What is large? I call his building a mountain. Around the building is nothing: trees, new park. The nearest building to our building is 200 meters. What does this mean? How can you design a building here? How can you plant a tree here? What is the reason to design the building here? So i design it like a mountain. Architecture design comes from memory. My work is with my wife. 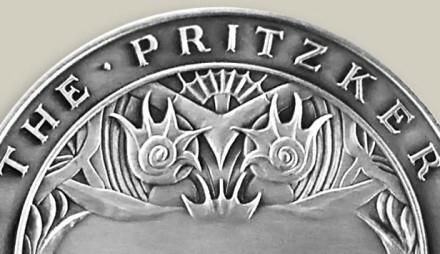 This Pritzker Prize is not just for me, but with my wife, my assistants, the President. Its my design but its not my design. Even until now I couldnt believe, did I really design this building? Is it really my work? 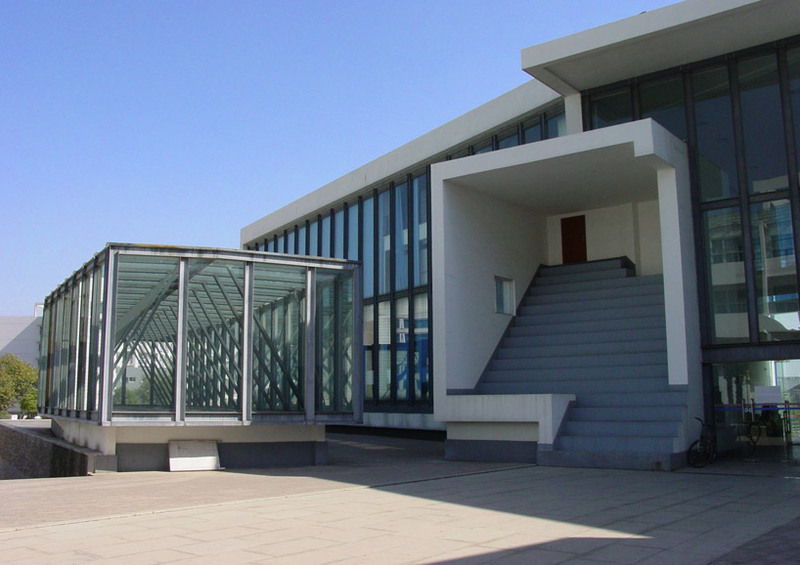 Many people love this building, originally the press office thought, if 3000 people come visit, it will be good. But 1 million visited in three months. I had a client yell at me, why is your design so old? So dirty? 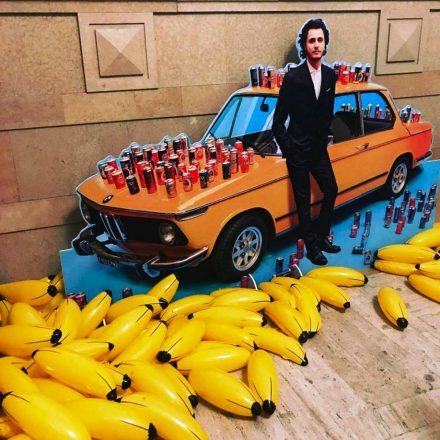 Whats the meaning in this new city center? Five years later, this client gave me a very formal apology. 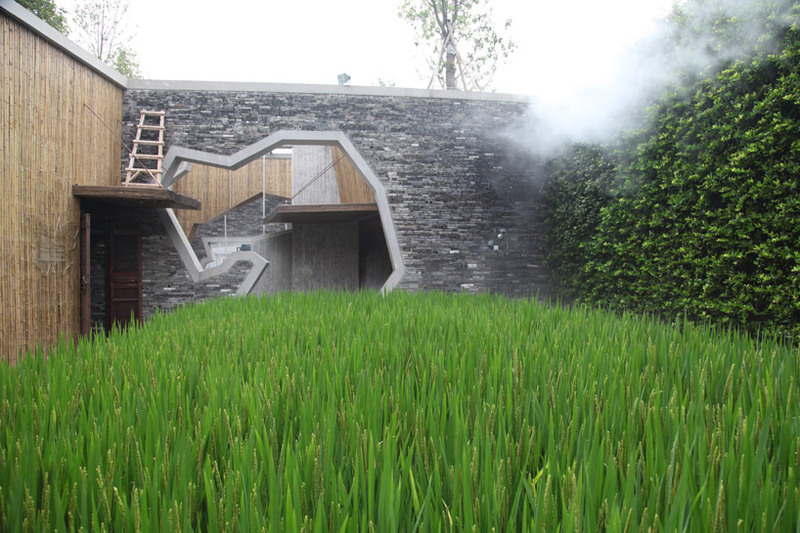 The last word today: how to reshape the rural culture in contemporary China? Is Urbanization the only way leading development? The situation is incredibly complex. Between 2000 – 2010, my studio did this work. Years ago Zhongshan Lu in Hangzhou was the main road for the emperor – here it is. Its a 6km long road. The major decided to give this job to me, but for my studio, I can only do 1 km. Whats the end, what the future? Everyone thinks traditional buildings will be demolished, so no one cares to take care of it. Its serious decay. 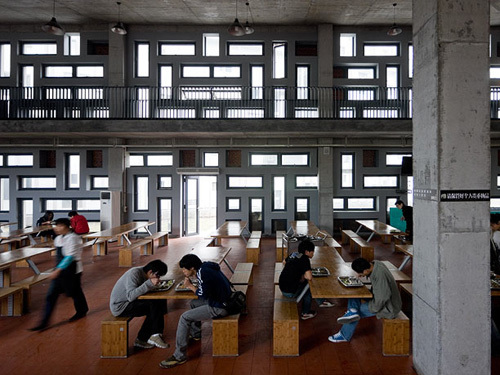 Amateur Architecture Studio focuses on a philosophy that was devalued for as long as a century in China. When I did the design, it still wasn’t finished by the time construction starts. They began, because in China things are really fast. Just one night later, the people’s houses are demolished, but people are still living around the construction. In China every street was expanded. I designed this small street in order to bring it back to traditional size; this additional space became a river. I wanted to build an exhibition hall. Two months before opening date, the major gave me permission. 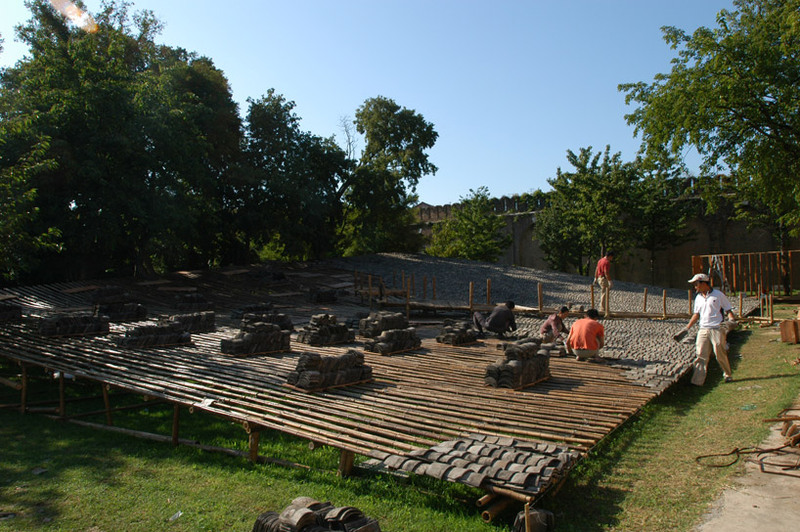 I was intrested in a long spanning structure, and only one carpenter knew how to build it, in all of China. But he refused to build it! He said, I only build bridges, not buildings. So we did some experiments. His own words: “In order to adjust to the modern principles, many of the details were changed. In fact, it was a brand new structure. I asked them the price for constructing this and got a price that was only half as I had predicted. It was impossible. But then I realised that the craftsmen never look at the drawings. They either had no idea of the cast-on-site concrete I required. I sent an assistant to watch the construction everyday. If there was any unexpected situation, I would go to the site. One day, I heard that the craftsmen were on the strike. The government then compromised and raised the price. Seventy days later, the building was finished. Artists try to transcend nature, but you tend to harmonize nature. Do you seek aspirations to transcend nature in your future work? Wang Shu: I think, for me, everything is important. Everything is possible. Of course I have respect for Prof. Lao Xie Tseng (name lost in translation). 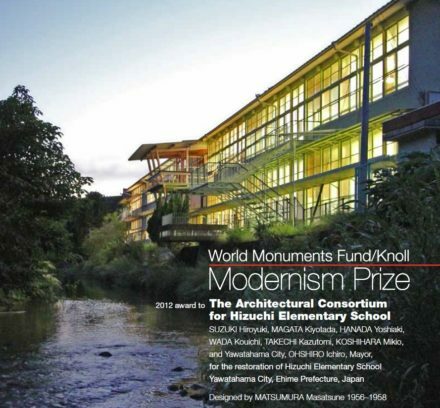 He is a big influence to architecture. But I also have critique – he just focuses on pattern, tempo, landmark that don’t have any potential to call on people’s heart. Twenty years ago, I was a very angry young man. Some people said, oh this guy, they go through the corridor, they say, this is not a man, this is a knife! In your presentation, you showed us landscape images and have divided them (the horizontal image) left and right and discuss the difference between nature and city; but then in the vertical painting, you show top and bottom and describe the relationship between human and nature. i was wondering, your work is very horizontal, perhaps like the first painting, but do you ever consider working vertically and building conventional Chinese towers? 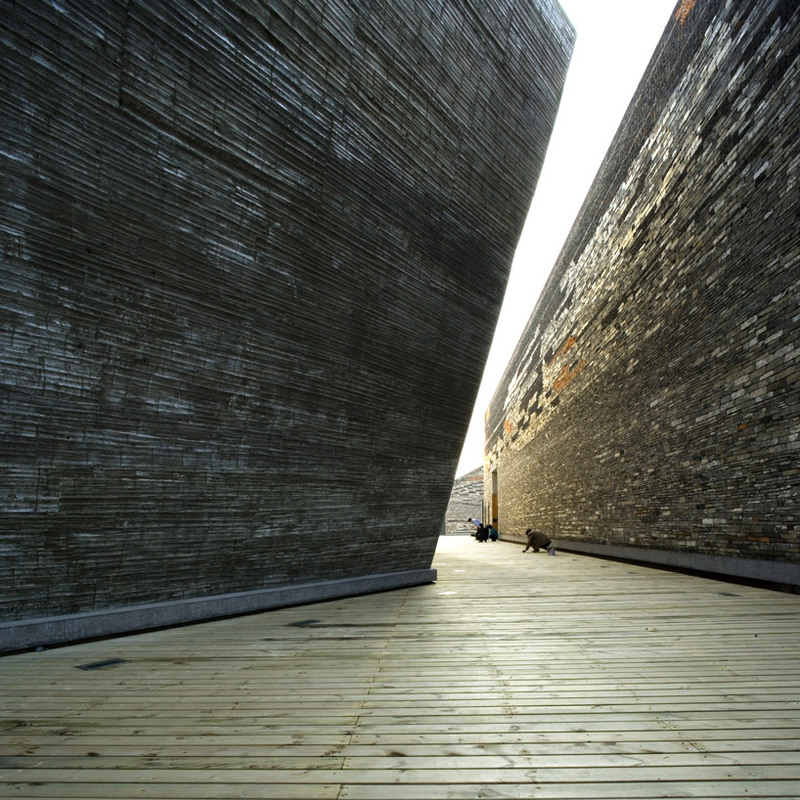 Wang Shu: Actually, the painting and my architectural work are not totally the same. I remember when I was a student, you talked with us about informality… What extends your interest in a more orderly and universal way? 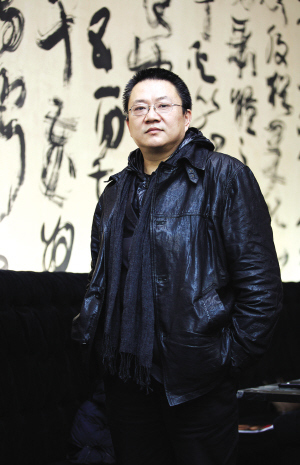 Wang Shu: In my work, I’m interested in spontaneous, more informal way of work. Thats a good question. But thats really another lecture. I can only talk in the biggest term: spontaneity. That’s my best attitude. Like David challenged Goliath in fully spontaneous way . 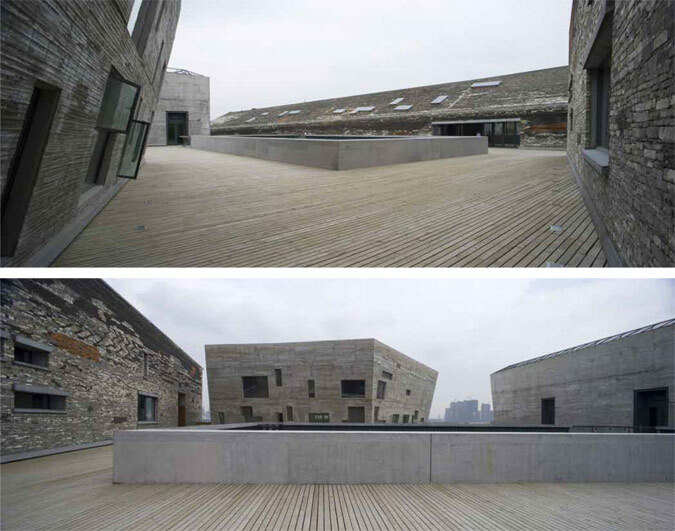 Wang Shu and Lu Wenyu founded the Amateur Architecture Studio in 1998. 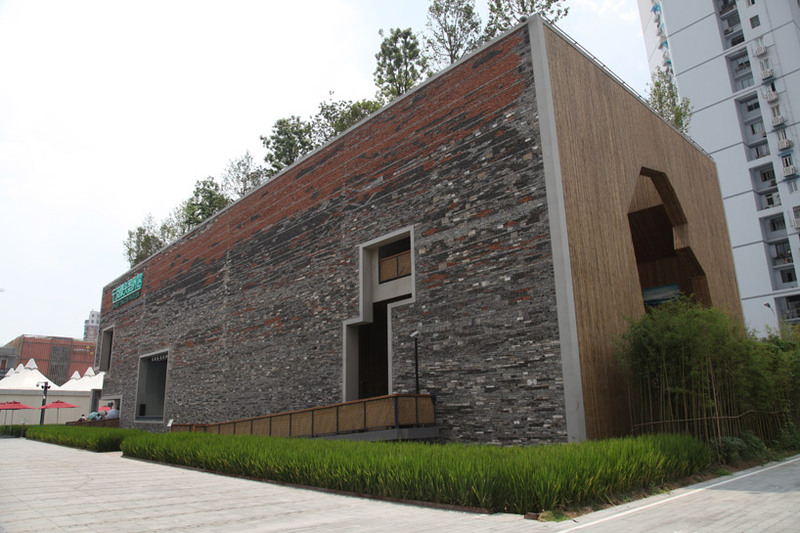 This Hangzhou-based practice has grown during the past eight years into a famous name in China. 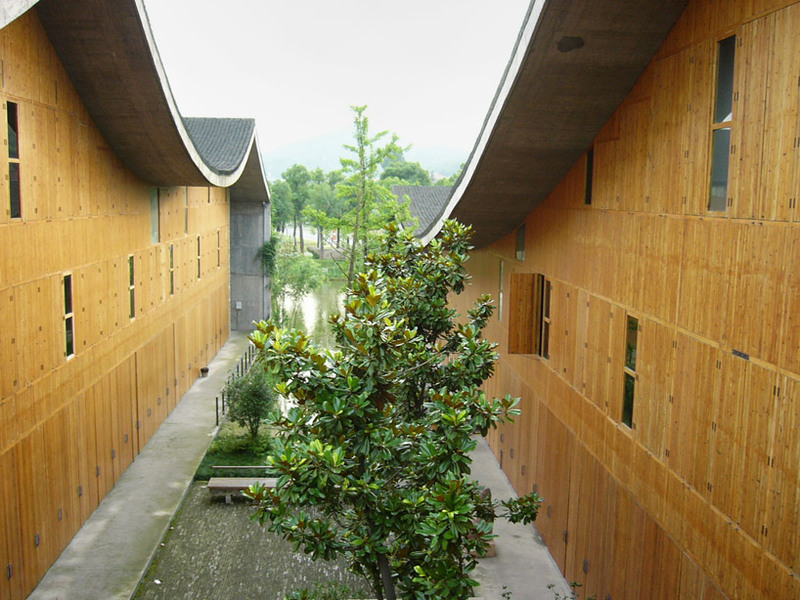 the Xiangshan Campus of the China Academy of Art in Hangzhou. ‘Architecture is as much a social activity restricted by spatial and temporal specificities, as an important component of social texture. Formed of many layers of social development, such textures become tradition and at the same time have their conspicuous regional and temporal characteristics. The architecture that I understand is the embedding, through the discovering, adjusting and restoring of the existing relationship and texture, of a distinctive layer of this epoch of ours, in cities and landscapes, between the past and the future. To embed also means to enrich, continue and develop our tradition, and further to explore the world that we seem already to have known. We appreciate the approach embodied in regional architecture of searching for appropriate solutions by following local conditions, whereby the human intimacy with and sensibility towards Nature are manifested; we exhaust all the possibilities provided by modern technology; and we utilize the local traditional crafts, techniques and materials. Through all these in the process of design, we pay attention to the essential quality of architecture and endeavor to create places endowed with the spirit of our time and the authenticity of our culture. Architecture has its own surroundings and root. It was born in the local site at the local time. Being firmly embedded, in+of architecture is therefore a kind of architecture, growing from its particular region and specific time. It should be confidently and yet harmoniously embedded in the locale of its growth, in a given place and given time, becomes a part of them.